We just came home from vacation. It's good to be home. While we were away, blueberries were crazy expensive. So Hubby got strawberries for K's oatmeal instead of his favourite blueberries. Now that we're home, I gotta make him a batch for the next few days. Boy was he happy to have his oatmeal again. In a medium pot, combine 1 cup blueberries, brown sugar, ginger, water, cinnamon and lemon juice and bring to a boil. Stir in oats. Turn heat low to a simmer and cook for 5 minutes, stirring occasionally. 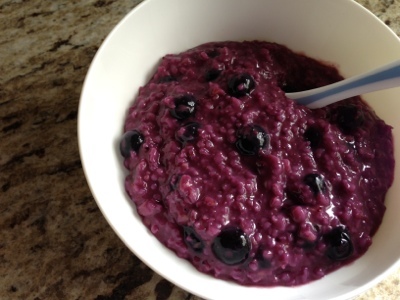 When cooked, turn off heat and stir in remaining frozen blueberries.